The original book was published in German and made family friendly. The Communist Manifesto is the second-best-selling book ever written, and mostly obviates the other divine opus, the Bible, though it has not yet displaced it from the 1-spot. It summarises the main pillars of Communism before denying that Communism would raise itself above ordinary, common pillars. Thus it established the contradictory technique that Karl Marx used to derive arguments. As the second best-selling book ever written, it has given book publishers all over the world an extensive amount of profit from copyrights with which to secure themselves as media outlets of the bourgeoisie and create false class consciousness for the proletariat to be misguided by. Originally entitled Manifesto of the Communist Party, the leaflet was hurriedly typed up by a political activist Karl Marx for the minor political party in order to have something to distribute around the local villages before the 1848 general election. In the Manifesto, Marx and his colleague Friedrich Engels first point out the contradictions of the socio-economic-political system they see around them, which Marx names "capitalism," and then proceed to propose a solution to fixing these contradictions, namely that workers ought to tear down everything around them in the same tone as Anakin Skywalker releasing his anger in Star Wars Episode III. The difference between the philosophy of Marx and Engels and philosophies that came before them was that Marx analysed the world through dialectics. He used subtle changes to grammar and vocabulary and put on slightly different accents in order to use language to confuse the reader into believing that his theory made sense. First, Marx tackles the question of the economy, "What is the economy?" He concludes from this that economy is bad. Thus, Marx rejected the notion of economy. Not just some parts of it, all of it. "Economy," he said, "cannot be reformed. It must be destroyed in some kind of revolution or something". 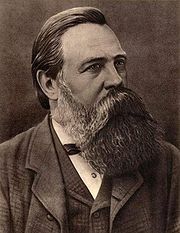 Friedrich Engels spent the rest of his life after Marx's death petitioning to change the ideology's name from Marxism to Communism with mixed success. Second, Marx tackles the question of politics. He showed that political interests were not linked to individual interests but rather to hatred of certain colours. Those with money liked the colours white and blue. Those without much money liked the colours red, yellow and black. This inherent trait of the capitalist system, Marx believed, determined who votes for whom. However, unlike previous philosophers and the capitalist propaganda machine, Marx did not attribute this inherent trait of the system to human nature and actually believed that it was dependent on the environment. This has since been used by the left and followers of Marx to argue against right-wing parties who win elections by pointing out that the large percentage of non-voters haven't been able to discover they prefer the colours of red, yellow and black yet - thanks to the capitalist system. Finally Marx proposed revolution. Marx did not mean for revolution to be interpreted in its modern colloquial way and actually proposed that people would only be maimed during the revolution and have their hands rather than heads cut off to avoid the revolution turning violent. The book famously ends with the line, "Let the ruling classes tremble at a Communistic revolution. The proletarians have nothing to lose but their chains. They have a world to win. Workers of the world unite!" This immediately distances Marx from Communist revolutions that have ended badly, as Marx clearly doesn't advocate a Communist revolution but rather a Communistic one. Marx uses chains to refer to bicycle chains. The bicycle had just come into fashion at the time as the common method of transport for workers to get down pit with and many workers complained of the annoyance caused when a bicycle chain came off. Marx tells workers that in the evening when they are home from work they must organise and unite together on the sofa in front of Eastenders. Engels, a bourgeois employer of wage slaves for a Mancunian factory that he had inherited from his father, funded Marx's life in order that the Manifesto could be written, and in doing so the Communist Manifesto became one of the most obvious and earliest examples of direct capitalist propaganda. Marx himself wrote the Manifesto in London, thus promoting globalised outsourcing of labour to countries where the labour was cheaper, a trait of modern globalised corporatism. He would often go to the ale houses and pubs of Soho, where he lived during breaks between writing. There he help to keep up the tyrannical alcoholic beverage industry, combined with an unhealthy drug-taking culture, so that the capitalist class could continue to delude the proletariat whilst sucking every last bit of value out of their miserable, worthless lives. Marx often found moments of immense pleasure in Soho's night district as he fell for the beauty that London has to offer. The pamphlet was originally designed as a simple flier done on the cheap to pass around until the Communist Party could afford a printing press and professional writers, but as with the world's first best-selling book, it was mistaken to be a moral guidebook with thousands of answers to life's problems hidden within. These people named themselves "Marxists" and they still thrive today infiltrating Labour Party branch meetings and secretly enforcing revolutionary ideas on how to deal with the state of the public toilets outside the railway station. The campaign team behind the 'Communist Party of the Federation of Micronesia (CP-FM long-wave)'s 1917 general election bid. A few hundred copies of the manifesto were produced for the 1848 general election, which due to stringent political campaigning laws, kept Marxists from distributing more than a handful. Marx was so irritated by the harsh government regulation on political campaigning that in the preface to the original edition he wrote, "OK, I know I argued for more regulation, but seriously, this is just going too far." This was the impetus for Marx to write three further books, The Abolition of Some Private Property, Increasing Taxes to a Reasonable Level and All Shall Be Equal, But Some More Than Others. The Manifesto became more widely published in the 1870s, by which time Marx had set up his own political organisation, The International Workingmen's Association (definitely not the International Communist Conspiracy - We Promise) and found that re-using old manifestos was far less time-consuming than bothering to write new ones. Another peak in publishing the Manifesto came in 1917, which famously was the year of the Federation of Micronesia's general election, in which the Communist Party was predicted to gain 2 seats, giving them a 67% majority government. Thanks to being an offshore tax dodge, they got a bit carried away with their political campaign spending and managed to produce 100 million copies of the Manifesto, distributed worldwide in multiple languages. The Communist Manifesto has been put to much use since it was introduced to the world over 150 years ago. It has exceeded in use as a doorstop, a draft excluder, and an excuse for the deaths of about 100 million people - those of unfortunate civilian casualties incurred in the CIA's endless pursuit to stop the book's ideas from spreading. The book was so well-received that no one has dared to write "The Capitalist Manifesto" for fear of tarnishing their career when it wouldn't live up to the standards that Marx and Engels set. Instead, they have left fiction to a book and set up capitalism in reality. One of the most famous applications of the theory in the Communist Manifesto was Liz Kendall's 2015 bid for Labour Party Leader. By creating a vanguard party centred around core Marxist agitators and by using the mass support of trade unions in major cities in the United Kingdom, Kendall hoped to be able to seize control of the state and enforce a dictatorship of the proletariat effortlessly. Unfortunately Labour's right-wing financial backers installed the far more popular and more easily electable candidate Jeremy Corbyn and so her radical plans were never realised. During a hairy moment aboard the Russia space station Mir in 1986, a piece of space debris tore a rip in an outer layer of the spacecraft. Due to the lack of organisation on board the space station, Russian astronauts could not find any material to cover up the hole with and so instead resorted to the nearest thing they could find, a copy of the Communist Manifesto that had been floating along a passageway. Historians recount duct-taping this over the hull breach as the only recorded example of Marx's ideas propping up the Soviet Union. This page was last edited on 21 February 2016, at 05:49.